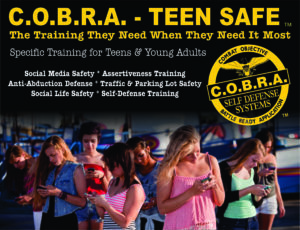 The COBRA Gold Solution to the problem of self-defense and personal safety that trains teens & college-bound students to walk empowered for all their days and provides parents peace of mind. Specifically aimed at the needs of teens and college students who need to be fully trained quickly. This group is statistically considered a major “easy target’, naive about real world violence and constantly bombarded with distractions and creative ways of getting in trouble with the Predators who target them. Teen Safe Training provides the cognitive, verbal, and physical skills that give Teens the ability to respond decisively and confidently to survive any encounter without being paralyzed by fear and the shock of the moment. They will know exactly what to say and do and have dominion over the decision making process under the stress of the moment. The Teen Safe curriculum focuses on topics and scenarios that make Teens easy targets for criminals. You’ll Go From Being Easy Target To Zero Target: You’ll Know the Exact Formula Criminals Use To Target Teens and How To Instantly Register as a Bad Idea In Their Minds. How To Profile Criminals and Determine what they really want quickly: Increase Awareness and Self Defense IQ 200%. You’ll know exactly what to say and do in ANY situation. AVOID Being Taken: You will have 7 layers of anti-abduction training including vehicle anti-abduction which forces criminals to abort the attempt and flee the scene. Defenses Against Knife Attacks: Lear how to survive this most dreaded assault and a surprising tool that can give you instant leverage, (Nope, not a gun). Defenses Against Firearms: Most people will freeze up when surprised by a gun assault in a parking lot or anywhere. You will have the exact mental, verbal , and physical skills that give you the 90% probability of surviving. The hallmark is the Live Scenario role playing under duress with experienced instructors along with the physical skill sets to survive a violent encounter. All parents/guardians will receive the COBRA Defense Teen Safe Parent Resource Guide, full of invaluable information on how to support Teen Safe & College Training strategies. Call (904) 608-1776 to register.